In the days following our return to Kansai, Takamatsu and I spent our time unpacking belongings, finding quality food vendors and exploring the stores in our town. I felt somewhat adrift in our new home; none of the furnishings were my own and now that we are relocated, a melancholy had settled in. I told myself, this is only temporary, just for a few months, but I longed for the things left behind. 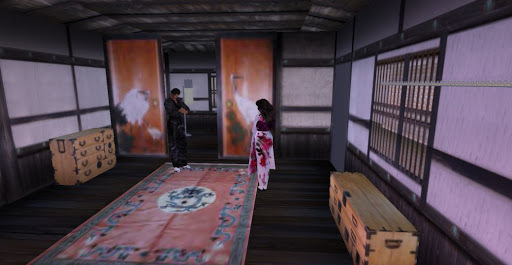 Our home is limited, especially our bedroom with room for few of our kimonos. But the main room is adequate for our belongings and foods & spices. The first day, Taka loosened some flooring and created storage for his weapons. For many days, Taka was not in a mood to begin introducing ourselves into the community, although we did enter the Nakanoshima compound and returned to the ochaya. There were geisha in the tea house but appeared to be a private meeting; no one greeted us so we realized we should just move on. We also spent time exploring the outskirts of Kansai. Although we’d been there before, it felt different because now it is our home town. The beauty of the surroundings was complimented with the milder temperatures of this region. In the afternoon of the third day, my Takamatsu’s mood turned to poetry and romance, and when he is this way I am mesmerized by everything he does. Takamatsu’s romantic moods are one of the things I most love about this man. We had decided to return to our house and spend a quiet evening in each other’s arms, but first he wanted to see the stage where I’d be performing in a few days. A large curtain covered the stage and I asked Taka not to peak so it would be a surprise on Sunday. I explained again that I’d just be dancing with the geisha of the okiya. A short time later, we returned home for our dinner and our special evening. 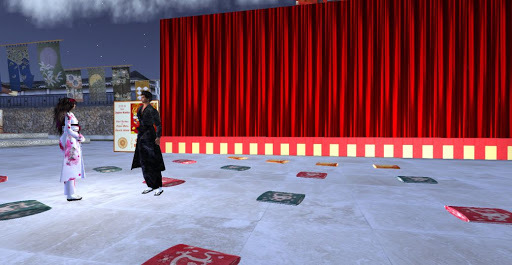 However, as we arrived at our door there was a message from my honorable onesan Masumi. She reaffirmed my role in the upcoming show, but added a most surprising request of me. I immediately asked Taka what his feelings were and he responded smiling, beaming with a brief affirmative.